Title song performed by Shirley Bassey. Very loosely based on a novel by Ian Fleming. 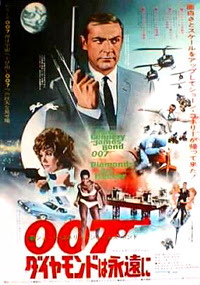 Diamonds Are Forever is the seventh film in the EON James Bond series. As with most Bond movies, the pre-production of Diamonds Are Forever is quite a tale in itself. George Lazenby left the series after one film. Actor John Gavin was consequently signed for the role of 007. And finally, at the last minute, Sean Connery was enticed back to the role of Bond for a hefty sum of money. As there are many good books and even a documentary, Inside Diamonds Are Forever on the DVD that recount the events leading up to the making of Diamonds Are Forever, I’ll leave it to the experts to tell the tales, but if you are interested, as I have said before, may I suggest, that you track down a copy of the book ‘Martinis, Girls And Guns’ by Martin Sterling and Gary Morecambe. It is a well researched overview of the series from Dr. No to The World Is Not Enough and fleshes out many of the production dramas that have happened throughout the series. But onto the movie itself. The previous Bond movie, On Her Majesty’s Secret Service, left us with a distraught Lazenby Bond cradling his dead wife. 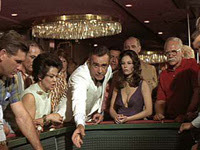 Diamonds Are Forever makes no obvious reference to the proceedings of the last film, other than, Bond is determined to track down Ernst Stavro Blofeld – his wife’s killer. Bond’s motivation for being so desperate to hunt down Blofeld isn’t specified either. It is almost as if the previous film did not exist. WELCOME TO HELL BLOFELD. The film starts with Connery Bond rough-housing a few informers to get to his nemesis, Blofeld (this time played by Charles Gray, who co-incidentally played Dikko Henderson two films earlier in You Only Live Twice). Bond’s investigations take him to a plastic surgery clinic, where Blofeld is attempting to make clones of himself. Bond intervenes, and finally kills Blofeld, sending his body into a pool of boiling mud. The titles roll; Maurice Binder’s graphics twirl, and good old Shirley Bassey belts out one of the classic theme songs. Does life get any better than this? Diamonds Are Forever has a tortuous plot, which I wont outline too heavily. Put simply, Bond has to investigate a diamond smuggling operation, which move diamonds from South Africa to Holland, and finally to the United Sates. Bond infiltrates the gang, posing as a smuggler, and follows the diamonds to Las Vegas and the casino of a reclusive millionaire, Willard Whyte. Along the way, Bond encounters a few Bond girls. The first is Tiffany Case, played by Jill St. John. Tiffany is the bad girl who turns good, but only after Bond has bedded her. Next we have Plenty O’Toole played by Lana Wood. Naturally with a name like Plenty O’Toole, there is a Bondian quip that goes with the characters introduction. And finally a special mention should go to Bambi and Thumper, played by Lola Larson and Trina Parks respectively. These lethal ladies give poor old Mr. Bond a hard time when he crosses their path. I like Diamond Are Forever. It is one of the wittiest of the Bond films, but the story is a bit of a mish-mash in places, and has some large gaping plot holes. But most people don’t go to a Bond film for the story. They go for a few hours of escapism, and on that level Diamonds Are Forever delivers. And, of course, it was great to see Sean Connery back in the role he was born to play. But Diamonds Are Forever is a bit of a step down from the Bond films of the sixties, and the injection of humour was a forerunner of things to come. Many people blame Roger Moore’s ascendancy to the role of James Bond as the turning point in the series. From then on, the films were played for laughs. Well that isn’t the case. Diamonds Are Forever is played totally for laughs, and as such the blame cannot fall solely on Roger Moore’s shoulders. It was obviously a decision by the film-makers, and co-incidentally it happened to suit Moore’s acting style…but more of that when I review Live And Let Die.